Affiliated Research Scientists – E.T.H.O.S. Vaibhav Garg is a post doc in the Computer Science department at Drexel University. He completed his PhD in Security Informatics from Indiana University, Bloomington. His research investigates the cross-section of security and human behavior. Specifically, his dissertation work identifies the underlying determinants of perceived risk online. The idealized notion of the rational end-user has failed systematically and predictably. Effective risk communication must then provide the pertinent information for the relevant user in the specific context. His current research includes cross-country examination of the macroeconomic factors that correlate with the prevalence of cybercrime, both voluntary, such as phish website hosting, and unsolicited, e.g. spambots. His research interests also include privacy, assisted living technologies, Internent governance, and information ethics. 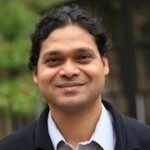 Sameer Patil Sameer Patil is a Research Scientist at the Helsinki Institute for Information Technology (HIIT) in Helsinki, Finland and a Honorary Research Scientist in the School of Informatics and Computing at Indiana University (IU), Bloomington, IN. Previously he was a Postdoctoral Research Fellow at IU. He has held appointments as a researcher at the Institute for Software Research at the University of California at Irvine (UCI) and a Visiting Assistant Professor in the Institute for Management Information Systems at the Vienna University of Economics and Business. Sameer obtained his Ph.D. in Information and Computer Sciences from the Department of Informatics at UCI with a specialization in Interactive and Collaborative Technologies. He also holds dual Master’s degrees – in Information, and in Computer Science & Engineering – from the University of Michigan, Ann Arbor. His Bachelor’s degree is in Electronics Engineering from the University of Bombay, India. Sameer was a summer intern at the IBM T. J. Watson Research Center, Hawthorne, NY, during the summers of 2003, 2004, and 2009, and Avaya Labs Research in Lincroft, NJ, during the summer of 2006. He has been a visiting research scientist for a term each at the Georgia Institute of Technology, Atlanta, GA, Karlstad University, Sweden, and Humboldt University, Germany. He has also served as an information technology consultant to companies and non-profit organizations. Sameer was born in India and grew up in the city of Mumbai (formerly Bombay). In his spare time, he enjoys traveling, hiking, and photography. Zheng Dong is a doctoral candidate of School of Informatics and Computing and lab manager of ETHOS. His research interests include privacy, incentive-aligned design and data mining. At IU, he is working with Prof. Jean Camp and Prof. Apu Kapadia. Zheng is part of several privacy-related research projects of ETHOS. He is also responsible for technology support, and management of all projects taking place within the lab.